Club Penguin Cheats by Mimo777 Club Penguin Cheats by Mimo777: Club Penguin Pufflescape Stamps Earned! Finally! I have earned all the Club Penguin Pufflescape stamps! It took me long enough, huh? You gotta love double coin bonus, eh? So, how are you doing with Pufflescape? Have you earned all the stamps? How long did it take you? Are you liking this game? I think it is the phoniest Club Penguin game in a long time! I need just one more stamp and that stamp is:Complete level 23. I hate level 23 in my opinion. But Pufflescape is still my favorite game cuz it gives you loads of coins. i got 705 coins just from finishing level 7.
i could not load the game properly. congrats Mimo! I'm stuck on level 18.
what about the fishie game?? which set of levels is easiest to get the Collect all dissapeering O's in one set of levels Stamp? How do u beat level 7 Timer challenge, its impossible!!!!!!!! 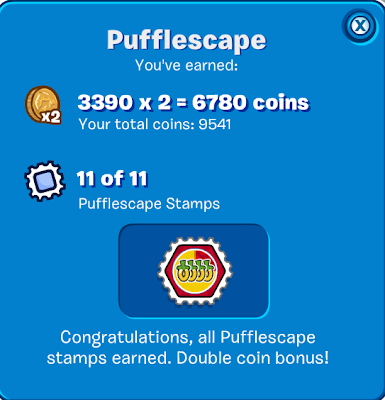 Ho do I get the 'Collect All Puffle O's In One Set of levels'? Which Set is Easiest? How Do I Beat Level 7 Time Challenge? im sorry but level 18 is like impossible for me. plz help!